← No future, for you and me. Or #Manchester, frankly. Councillor Rosa Battle says hundreds consulted on Green Infrastructure. Actual number – fewer than 50. Councillor Rosa Battle, Executive Member for Culture and Leisure, told elected members of the Council that hundreds of people had been consulted on the outsourced-for-£30,000 “Green and Blue Infrastructure” strategy. The actual number, once you take out council employees? Less fifty. So, how does this statement of “over 200 people consulted” actually stack up? 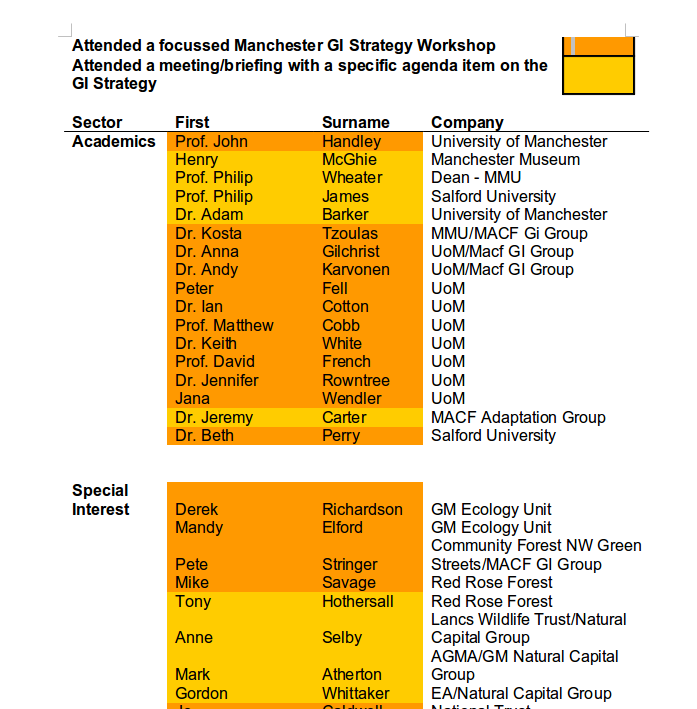 and also seems to include attendees at a (University of Manchester) workshop that didn’t in fact take place until 2 months AFTER the claim of hundreds of consultees. And I’ve nothing against academics (cough, cough), but they’re not exactly ‘members of the public,’ now are they? Will Neighbourhoods Scrutiny Committee take this forward? (1) In July 2013 the Council Leader Richard Leese told full council that the already long-delayed Green and Blue Infrastructure strategy was going to Neighhourhoods Scrutiny the following week. any public events held by Manchester City Council at which the Green and Blue Infrastructure was the focus of discussion, including the dates and venues of these meetings, and the rough estimates of attendees. Indicative examples of where opinion has been sought via the communications (newsletters, magazines, e-bulletins) of partner organisations (e.g. Red Rose Forest, GM Ecology Unit). As I said in the meeting, no mention of the GBI strategy has, to my knowledge, been made in Friends of the Earth’s weekly digest. This entry was posted in Democratic deficit, Green spaces. Bookmark the permalink. 5 Responses to Councillor Rosa Battle says hundreds consulted on Green Infrastructure. Actual number – fewer than 50.
you’ve been doing this for years, haven’t you realised yet that the council has a different definition of ‘consultation’ to the rest of the known world? I have indeed been doing this for years! I do hope that we do indeed get what all councillors want – a robust and adequately-consulted-upon strategy, instead of something that is just another top down document with no community ‘ownership’. One that is actively ‘done’ and measured, unlike the Biodiversity Action Plan, which has, to my knowledge, never been reported on to any Scrutiny Committee. And how many of those academics actually live in the City of Manchester? Those of us who have had dealings with Rosa Battle, know she takes after her father, a liar and a bully. Well, I want to make it clear that nowhere in the article did I imply that she had deliberately mis-led the Neighbourhood Scrutiny Committee. The lack of a Green & Blue Infrastructure strategy doesn’t seem to have stopped some of the amazing things that are happening now, or are going to happen soon, to our local environment. We’re only half way through the second month of 2015 and I can’t believe some of the plans that are being implemented now, or are about to be implemented! Last year the Council went into partnership with the RSPB to manage the Mersey Valley – and possibly because the RSPB is the UK’s leading wildlife charity, wildlife seems to have more priority than it did before. Next week, Mike Carswell, Manchester’s professional coppicer, will start managing the woodland on Chorlton Ees and Ivy Green in the traditional way. The woodland will be divided into blocks, and these blocks ‘coppiced’ on a 10 year rotation. Most British broad-leaved tree species will, if cut to ground level, sprout multiple poles from the base. These poles are then harvested, on a long cycle, and are used for firewood, charcoal, fence posts, tool handles etc. This process is called coppicing and is an ancient craft in Britain. In each block, a few healthy, robust looking trees are left uncut. Because they have less competition they develop into even healthier, robuster ‘standards’. A by-product of coppicing is a more biodiverse woodland because more light is let into the habitat and it becomes more varied. The Greater Manchester Ecology Unit also have a plan to cut Mersey Valley grasslands for hay and to re-introduce some grazing. This is, of course, the way that MV grasslands were managed for centuries and should also lead to an increase in biodiversity. The SUSTRANS cycling charity are now managing their cycle tracks (e.g. the Fallowfield Loop in South Manchester) as ‘wildlife corridors’ using ecologically sound methods. I have found the Fallowfield Loop to be particularly rich in plant life – so the application of the right management techniques should help to conserve these plants and, in time, lead to the habitat becoming even richer. In Trafford’s part of the Mersey Valley (wildlife doesn’t recognise human boundaries!) the local branch of the Trust for Conservation Volunteers are now based at the old MV Visitors’ Centre at Sale Water Park. They are working with volunteers to manage the rich habitats around the Water Park. Meanwhile, Red Rose Forest are working in partnership with Trafford Council on their part of the MV. Recently, RRF did a fine job clearing the vegetation that has been encroaching on the Trans-Pennine Trail, in the Stretford area, for years. This management should also increase local biodiversity. There are several other things happening as well – but that’s enough to be going on with! Who needs a Green & Blue Strategy? !